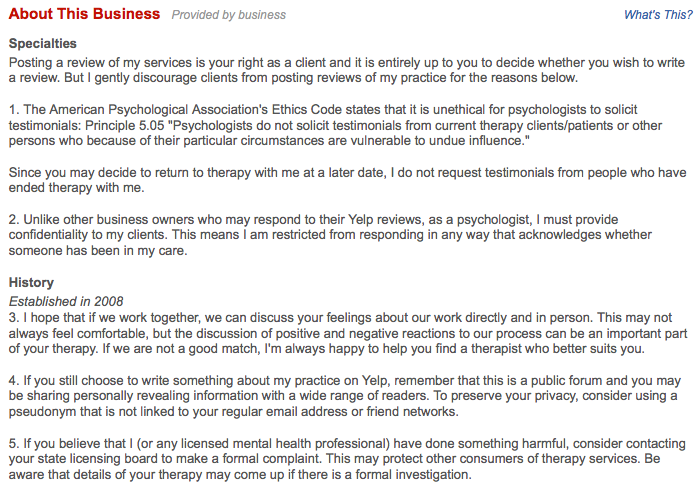 SXSW 2012 – WARNING: Are Online Reviews Bad for Your Health? I’m back from SXSW, where I got rained on HARD and also got to network and socialize with some of my favorite people. My session was on the challenges raised by consumer reviews of healthcare providers. You can read the Storify story of tweets below. Thanks to everyone who came and asked great questions! You can also hear the full audio here, and view the Storify tweets below. Tweets from SXSW session WARNING: Are Online Reviews Bad for Your Health? Session moderated by Cindy Cohn, Legal Director of EFF. Panelists: Jeffrey Segal, CEO of Medical Justice, Dr. Keely Kolmes, SF Psychologist in private practice, and Vince Sollito, VP at Yelp. My site has a lot of exclusive content I’ve either written myself or outsourced but it seems a lot of it is popping it up all over the web without my agreement. Do you know any ways to help protect against content from being ripped off? I’d really appreciate it. I did once have someone copy an entire blog post and put it on their site. Probably the best thing to do is to put a copyright notice on each post. Something like this: © 2010 Keely Kolmes, Psy.D. To cite this page: Kolmes, K. (2010) An introduction to media psychology for bloggers and tweeters. Retrieved month/day/year from http://drkkolmes.com/2010/06/28/an-introduction-to-media-psychology-for-bloggers-and-tweeters. I have also sometimes sent people a link to articles on blogging ethics. Here is an example of one by Corey Eridon.